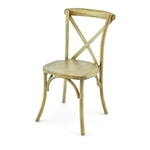 Cross Back Chairs also known as X Back Chairs are a great alternative to Chiavari Chairs. Our Cross Back Chairs are considered the Finest X Back Chairs on the market. For over 7 years we have sold our X Back Banquet Chairs to over 1,000 Customers Worldwide. 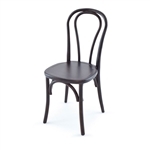 Our Wedding Cross Back Chairs are Commercial Grade and have a Capacity of 1,000 lbs. 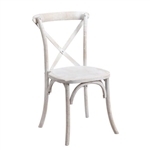 Cross Back Chairs are great for Rustic Event Wedding Centers. Cross Back Chairs add a special dimension to any event wedding center. Wholesale Cross Back Chairs can be used for Indoor or Outdoor Events.